The people of Umuahia South LGA have restated their total support for the reelection of Governor Okezie Ikpeazu in 2019. The people spoke through their leaders today when they paid a solidarity visit to Governor Okezie Ikpeazu at Government House Umuahia. The leaders who came from the three major blocs of Umuahia South namely – Olokoro, Ubakala and Umuopara assured the Governor that they will vote massively for him in the 2019 elections as a result of his sterling performance especially in the area of road construction. 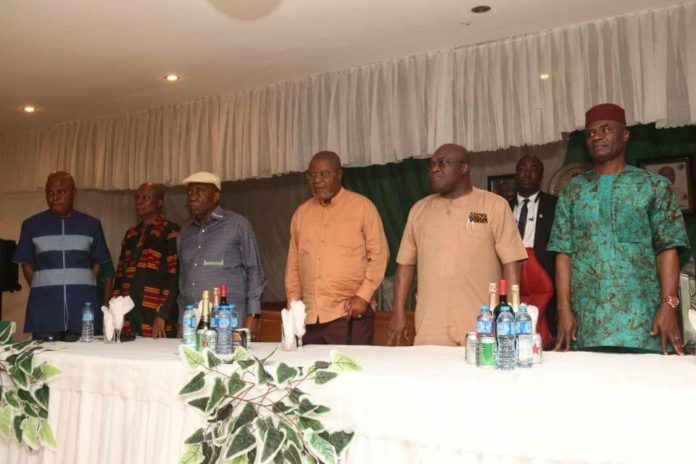 Speaking on behalf of the leaders, a political stalwart and former PDP State Chairman, Chief Tony Ukasoanya told the Governor that he worked for APGA in the 2015 elections but having seen the performance of the Governor since his election, he decided to return to the PDP and assist to galvanize his people’s support for the Governor. The delegation included former Federal Minister and former PDP National Chairman, Prince Vincent Ogbulafor, Barrister CSL Nwosu, Arc. Benson Ezem, Chief Emeka Inyama, Chief Tony Ezebuiro, etc. The Executive Chairman of the local government, Obioma Bibi Ogbulafor was also part of the delegation. Each of them spoke in the same vein. Responding, Governor Ikpeazu thanked them for their assurances and promised to undertake a study of the Olokoro Ring Road which connects Olokoro Community with the University town of Umudike and directed the Commissioner for Works to arrange a visit for him immediately. He said the road will help ventilate Umuahia town and decongest traffic around the Government House/Umudike junction. He also promised to revisit the Umuopara Ring Road Project. He also assured that the expansion and dualization of the new Umuahia road from Isi Court junction through Amakama will also be done as part of the larger contract for that road. He assured the people of Umuahia South that his government will always take issues concerning them seriously as the council has produced notable people that have served our state and country very well at different times.